This past weekend, Saturday Night Live aired a fantastic, on-the-mark satire of Scientology. It’s a spoof of We Stand Tall, a music video the church made in 1990. It was featured in Going Clear, the new HBO documentary that has been seen by at least 1.7 million viewers. When I watched the film, it was the first time I heard of the song’s existence and it reminded me of “We Are The World,” but creepy and done for indoctrination purposes, not charity. This type of satire often greatly stretches the truth for comedic effect. However, this was not far from reality. The church has done some terrible things to its members; not much exaggeration was needed. A great rundown of the video is at The Underground Bunker. I’m glad to see an increasing amount of criticism and satire of Scientology on television. It’s not as plentiful as perhaps it would be if the church didn’t intimidate networks with lawsuits, but it seems like we’re getting there. NBC, the home of SNL, also did a two-part exposé on Scientology in 2013 on Rock Center with Brian Williams. The SNL video has reminded me of some older media mocking the religion. Here are my favorites. “A Token of My Extreme” was released by Frank Zappa in 1979 on Joe’s Garage. He gets props for satirizing the religion before much of the general public was aware of its existence, as well as the comedic use of Appliantology and L. Ron Hoover. “The Parking Garage” debuted on NBC in 1991. The part that mentioned Scientology happened somewhat quickly, and might have gone over a lot of people’s heads when it was first aired. This was when the religion wasn’t covered as much in the media, and most people didn’t have Internet access. In the scene, George upsets a woman by speaking negatively of Scientology and/or its founder L. Ron Hubbard. After George and his friends are kicked out of her car, Jerry remarks, “Boy, those Scientologists. They can be pretty sensitive”. I first saw this episode almost a decade ago, when I was watching Seinfeld in syndicated reruns, and I understood the reference. 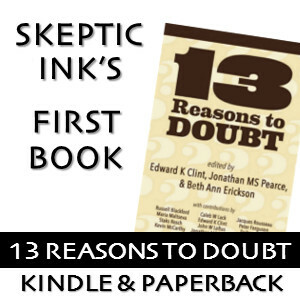 By the time I first started watching the sitcom, criticisms of Scientology were a common topic of conversation online and in person, thanks to Tom Cruise’s behavior on Oprah and comments in interviews. What I didn’t know back then was that Jerry Seinfeld had taken some Scientology courses in the 1970s, but he did not join the religion. He doesn’t seem to say anything negative about the church in interviews, but the Seinfeld scene and the fact that he didn’t stick around might mean he privately doesn’t think highly of them. This was first aired in November 2005, when much of the general public were learning about Scientology, thanks in large part to blogs, video, and MySpace responding to Tom Cruise’s criticisms of mental health care. 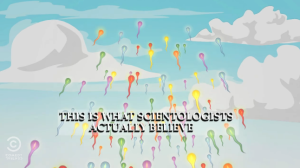 I was unaware of the Xenu belief until this episode. Even though the words “This is what Scientologists actually believe” are shown across the scene during the explanation of the Xenu story, I still had to look that up for myself before I believed it was an actual teaching of Scientology. Many of my friends have told me that it was this South Park episode that made them aware of what the church does, and some of them did further reading about it on their own after viewing it. Many people were surprised that South Park would directly criticize the religion, but they were widely applauded for doing so. The show mocked the litigious behavior of the church and Tom Cruise by not listing any of the people who worked on the episode. Instead, all the names on the credits were John Smith or Jane Smith. Side note: Frank Zappa also mentions “trapped in the closet” in “Token of My Extreme”. What are your favorites? Are there other good ones I didn’t mention here? Please let me know in the comments. Thanks. Cherry Teresa is a blogger and musician from Los Angeles, CA who includes skepticism and humanism in her work. Her music can be heard at cherryteresa.com.